Science is a self-regulating profession. It always has been and continues to be relatively free from external state legislation, because scientists – equipped with specialized and superior knowledge – are best fit to determine the rules of their game. This liberal view is so deeply embedded in many (western) societies, that it is also reflected in constitutional provisions and legal doctrine on academic freedom. Yet, recent developments in the academic system and the ongoing crisis in biomedical research particularly warrant the question whether this laissez-faire policy is still in the best interest of scientific progress. And if not, what measures could be taken – both internal and external – to address problems while all the same upholding a high standard of academic freedom? Meta-research and critical science analysis have been a focus of the BMJ Open Science blog. Issues like replication crisis and publication bias, methodological weaknesses, lack of transparency or failure of translation have been discussed in posts by Frank Miedema and Trish Groves, or the inaugural editorial by Emily Sena. With regard to conflicts of interest, Harriet Ruth Feldman, Ben Goldacre and others have in a recent BMJ Open paper suggested to introduce an “openly accessible voluntary register where any healthcare professional, manager, or researcher in the UK could openly log their conflicts of interest in a structured searchable format”. 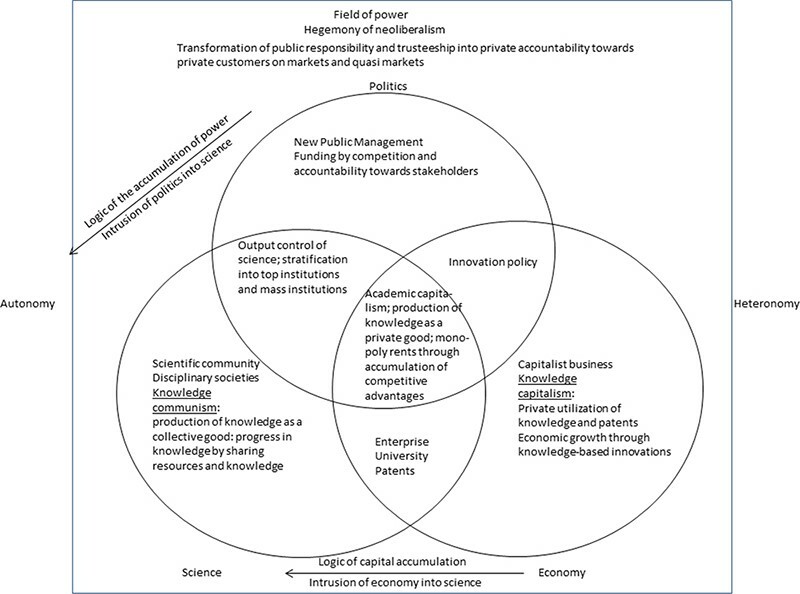 On an abstract level, the theory of academic capitalism (coined by US sociologist Sheila Slaughter) analyses the effects increased intertwinement of scientific and politico-economic interests has on the scientific system and thereby on research quality. Academic capitalism at the zone of the intersection of science, economy, and politics. Münch, R. (2016). Academic Capitalism. Oxford Research Encyclopedia of Politics: Figure 2: “Academic capitalism at the zone of the intersection of science, economy and politics” (p.9) © by permission of Oxford University Press, USA (www.oup.com). All rights reserved. These initiatives are proof that awareness for scientific problems is sharpened, but they have not yet gained the support needed to sustainably initiate change. For constitutional law, the question is if, and if yes how, it should react to these new challenges which have arisen in the academic system. Faced with the realm of the current situation in (biomedical) research, a revised understanding of the academic system, research, and the freedoms and obligations of scientists may be helpful. 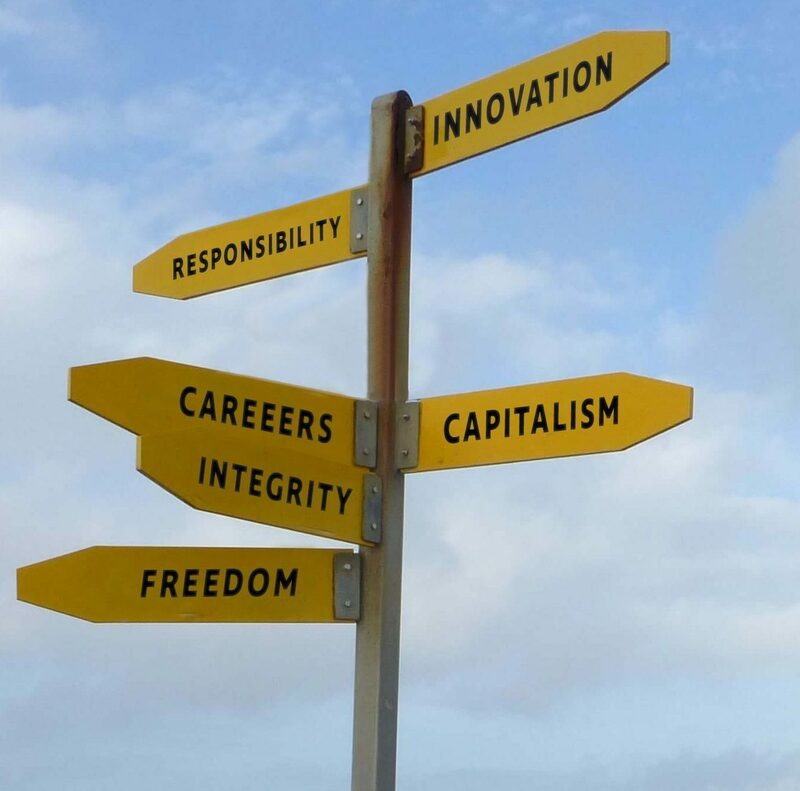 The law can provide a conceptual framework to systematise initiatives for reform and guide the debate on fundamental values like academic freedom. Is there a right of everyone to benefit from the results of scientific research as counterpart of the liberty enjoyed by academics? Is there a duty to carry out research according to certain quality criteria, in a straightforward, transparent, cost and time efficient, truth-oriented manner? Do scientists have a professional responsibility towards the public to adhere to certain standards of integrity? 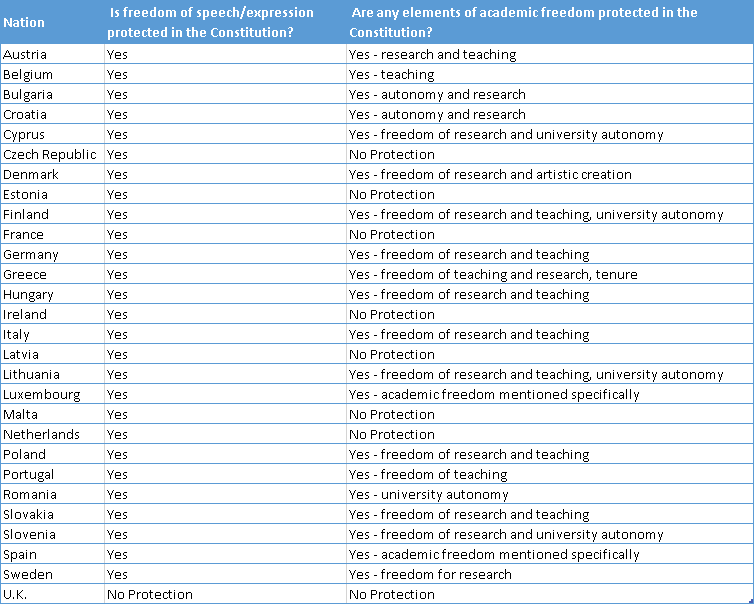 The traditional understanding of academic freedom focuses on the right of individual researchers or institutions to carry out their research free from interference by the state, and this is also reflected in the wording of constitutional provisions in many European countries, in which academic freedom is explicitly protected. For instance, Article 5(3) of the German Basic Law states that “art and science, research and teaching are free” (Grundgesetz für die Bundesrepublik Deutschland, accessed at: https://www.bundestag.de/gg). Article 33(1) of the Italian Constitution asserts, “the Republic guarantees the freedom of the arts and sciences, which may be freely taught” (Costituzione della Repubblica Italiana, accessed at: http://www.governo.it/costituzione-italiana/parte-prima-diritti-e-doveri-dei-cittadini/titolo-ii-rapporti-etico-sociali). Admittedly, academic freedom has been specifically laid down in these constitutions as an afterthought to the war, when minds were set on preventing the perversion of science for political purposes, above all else. In other states, like Canada or the US, it is protected as part of the freedom of opinion and expression, for the US guaranteed in the First Amendment (Bill of Rights, accessed at: https://www.archives.gov/founding-docs/bill-of-rights-transcript). In other states still, like the UK, a written constitution that could explicitly or implicitly protect academic freedom does not exist altogether. However, although specificities in recognition and scope of protection vary between states, the existence of the individual dimension of academic freedom is widely established. Terence Karran and Lucy Mallison, Academic Freedom in the UK: Legal and Normative Protection in a Comparative Context, Report for the University and College Union, May 2017. So, in many countries, research is free. Yet, free from what? Free from outside (state) interference alone? Or free also from internal (system imminent) forces that distort the search for truth? This question has not been discussed in legal doctrine on academic freedom so far. On the contrary, the concept of public responsibility of research professionals and societal benefit from scientific progress is often viewed critically or completely rejected in national constitutional scholarship. In international legal scholarship – where it exists – it has received little attention so far. Article 15 of the International Covenant on Economic, Social and Cultural Rights (ICESCR) does profess that “everyone has the right to enjoy the benefits of scientific progress and its applications“ and that „the steps to be taken by the States Parties […] to achieve the full realization of this right shall include those necessary for the conservation, the development and the diffusion of science“ (ICESCR, UN-GA Res. 2200A (XXI), adopted 16 December 1966, entered into force 3 January 1976, Article 15 (1)(b), (2), accessed at: http://www.ohchr.org/EN/ProfessionalInterest/Pages/CESCR.aspx). Still, details of this conception remain unclear and fuzzy. How comprehensive is the protection of this public, collective dimension of science? Who has to respect it and who can claim it? How is it enforced and how does it have to be balanced against conflicting rights? The goal of this discourse is to foster thought on these fundamental concepts and enhance reflection about the academic system we want to work in, much rather than to establish a claim for unwieldy science regulation. In the present climate, academic freedom is often invoked as defense against unwanted insight or control, when it should be seen as a liberty that must be honored with a responsible and careful professional attitude. Many in the academic community undoubtedly adhere to high ethical standards. However, the same cannot be said of the system itself, which has come to reward careerism and short-term output much more than rigorous methods and pertinent findings. Thus, while overregulation is certainly not desirable, we should be cautious that the current understanding and use of academic freedom does not turn it into jester’s license. 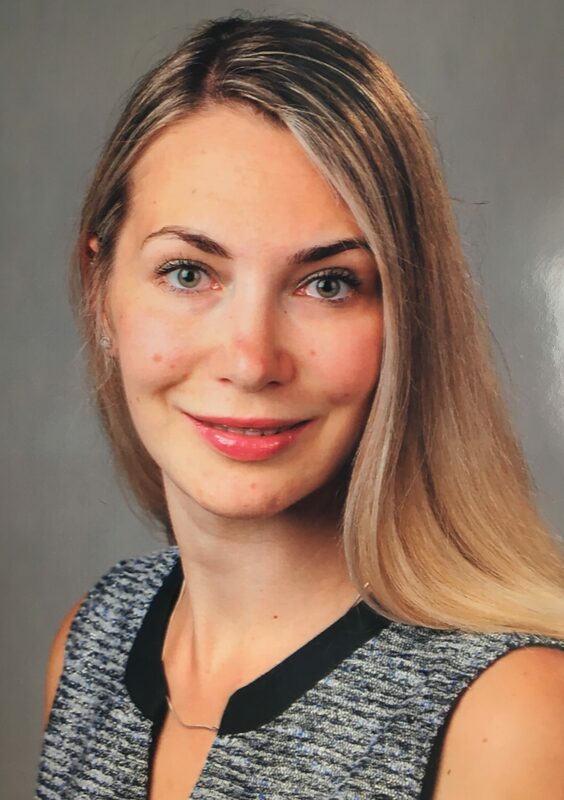 Lucia Reuter is an interdisciplinary PhD researcher in Neuroscience and Law at the Berlin School of Mind and Brain, and 2018-2019 Fellow at the Stanford Program in International Legal Studies.